In the constellation of Ursa Major there is a pretty planetary nebula, Messier 97. Discovered by Méchain in 1781, it was named "the Owl nebula" by Lord Rosse who drew it in 1848. Twenty years later, Huggins determined its gaseous nature using its spectrum. The nebula is shell shaped and was probably ejected 6000 years ago by a magnitude 16 central star. 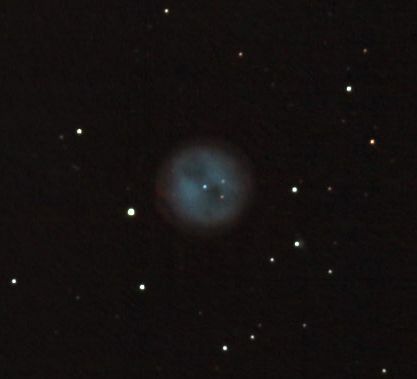 An image by "baf" (the person's pseudonym on the forum) taken by a digital reflex camera with a 150 mm diameter telescope.